We are just starting the second week of school and it is killing me a little! I have four kids at four different schools, so from 5am - 9am I am getting them up and where they need to go. I am trying to be good about dinner and have been trying to remember some of my favorite easy dinner recipes. Tonight we are having crock pot teriyaki chicken using the recipe from Gimme Some Oven. I have a couple of different teriyaki recipes that we rotate through, but this one makes everyone happy and the fact that I can put it in the crock pot before noon and have it ready by dinner makes it the clear winner for the first back to school Monday! Another thing I love about it is that it uses ingredients that I usually have in the house (soy sauce, rice wine vinegar, garlic, honey). I don't always have fresh ginger, but I have substituted with ground ginger and it is still yummy! I have even used dehydrated onions a time or two. 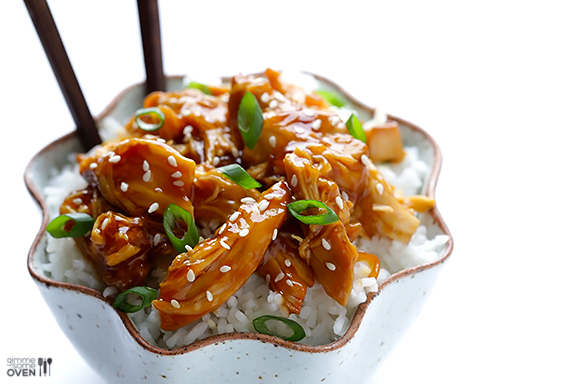 You can get the recipe for Ali's slow cooker teriyaki chicken over at Gimme Some Oven.